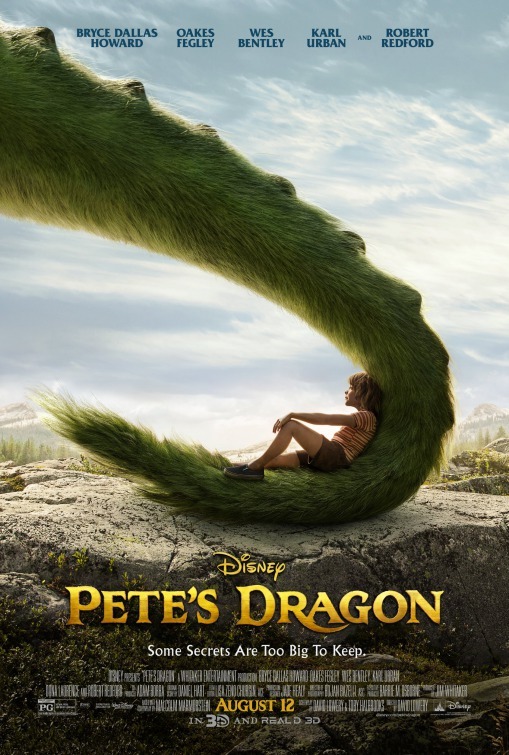 Synopsis: The adventures of an orphaned boy named Pete and his best friend Elliot, who just so happens to be a dragon. Review: If you were to visit The MN Movie Man’s house during the early eighties, on any given weekend you can be sure that at some point Pete’s Dragon would be unspooling on an oft-rented (eventually purchased) VHS cassette. The 1977 Disney musical production was a household favorite and Helen Reddy’s plaintive Candle on the Water remains one of my favorite tunes to this day. So you’ll understand that when I heard Disney was adding Pete’s Dragon to it’s expanding list of remakes, I was less than thrilled. How dare the studio take its folksy tale of a boy and his dragon changing a small New England town and its residents for the better and put a 21st century spin on things…and would they stoop so low as to have some pop princess warble out an auto-tune version of Candle on the Water? Right up until the lights went down and the Disney logo appeared on screen I was on the defense…but then something downright magical happened. I loved this remake. When I say loved, I don’t mean in the same way you say “I love that new Rogue One: A Star Wars Story trailer” but loved in the sense that you feel a wave of warmth emanate from your belly just thinking of certain key scenes in writer-director David Lowery’s damn lovely re-imagining. Not only is it the best family film to come along in ages but it’s without question the best movie released so far this summer. People wanted to believe that the terrible Suicide Squad would save the (summer) day and forgive the June and July trespasses but it turns out that Pete’s Dragon is the one that flies highest. The first thing Lowery did was wisely throw out everything but the names of Pete (Oakes Fegley, This is Where I Leave You) and his dragon Elliot (spectacularly rendered via CGI). Gone are the songs, the East coast setting, and the plot involving a runaway orphan finding a home with a lighthouse keeper and his daughter in the early 1900s. Lowery knew the charming yet staid quaintness of the original and it’s accompanying songs wouldn’t appeal to modern audiences so he’s set his film in the 1980s Pacific Northwest. By the time the credits are over, toddler Pete has been orphaned via tragedy and adopted by a gentle dragon he names Elliot before disappearing into the forest for the next six years. Found by a kind forest ranger (Bryce Dallas Howard, Jurassic World) and befriended by her future stepdaughter (Oona Laurence, Bad Moms), a near-feral Pete warms to this new family but struggles to leave the pain of his past and his fire-breathing constant companion behind. There’s some late in the game roughness involving a logger’s (Karl Urban, Star Trek) plot to hunt down and trap Elliot that gives the film some tangible conflict but it’s the emotional conflict that is the biggest test for all involved. This is a film you’ll get a good cry at so just go with it and enjoy the way it kindly pushes your emotional buttons. It’s not manipulative or malicious in its intent and, man, it feels so good to have an honest response to a movie this far into 2016 when many films have left me cold. The actors, especially Howard and Fegley, do outstanding work and Robert Redford (All is Lost) exudes grandfatherly warmth as Howard’s dad with his own ties to Elliot. Where the 1977 Elliot was an animated goofball with neon lime green scales and pink accents, the 2016 version is impressively created as a furry tenderheart endlessly devoted to Pete. With dog-like mannerisms (watch him struggle to get a giant log through two towering trees), Elliot wins you over from the first time he appears onscreen and thankfully the folks at Disney don’t keep him under wraps/invisible for much of the movie. Beautifully produced and told with grace, Pete’s Dragon is the kind of remake that shows how to do it right. If the original wasn’t broke, don’t fix it via a remake but use it to inspire a new tale that can stand on its own against its predecessor. The two films may share a title but they couldn’t be more different in style and tone…and this new version easily earns a spot on the shelf of future family classics.